He figured that the backseat of any car that is designed to take 3 adults should be wide enough to take 4 children. And as he spent his life designing solutions to other companies’ problems, he quickly designed and patented the first Multimac. Using his contacts in the metal working industry and knowledge of automotive safety he went about making prototypes, and started a development and testing program of the multiple child seat at BSI, alongside his other engineering projects. Whilst friends and family thought he was mad spending all his money on this seat, he continued, jumping over every hurdle that came his way (and believe me, there were many). Meanwhile, having proved on test that the Multimac was very safe, his own 4 children sat in a Multimac day to day. 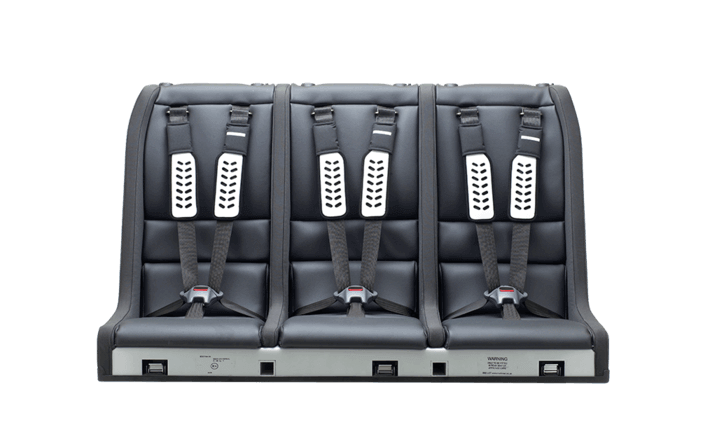 Getting approval was an incredibly long process as the rules were written around single child seats, so there was no protocol for testing a multiple child seat, and the Multimac had to be tested on a single-seat wide test rig. 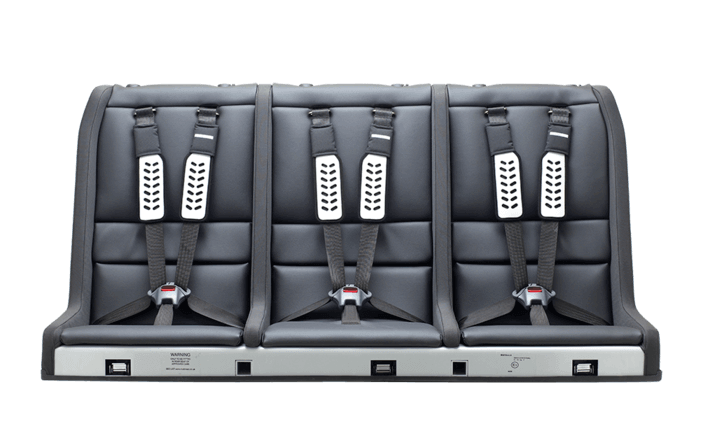 BSI elected to test it with a 10 year old, six year old, 3 year old and 9 month old dummy sitting next to each other in that order, so the loading was extremely lop-sided, but on 11-11-99 the Multimac passed the test, with all dummies head displacements and chest decelerations well within the allowable limits. Two wasted years of politicking followed, with meetings and discussions with VCA, TRL, BSI and eventually the European Parliament, who agreed that a multiple child seat was a useful invention, and it was eventually decided to continue testing and approval in Sweden, the ‘home of child safety’, whose test rig did have a floor… and who welcomed the innovation and inherent safety design of the Multimac. By this time, the regulation ECE44-03 had been superseded by ECE44-04 and the Multimac had to be redesigned to incorporate various detail changes. Normal child seats are designed for a specific age/size range, and they may be tested with one dummy. 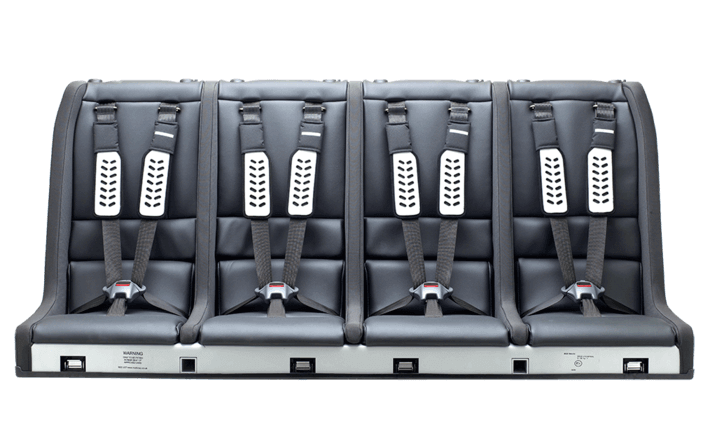 Multimac could have one newborn, or 4 x twelve year olds, or any combination in between sitting in it at any one time [actually 4,000+ combinations…] so it was decided that Multimac would have to do 11 crash tests to cover all worst case scenarios, every time any detail was changed. So, instead of turning up for a couple of hours to test a typical single £200 seat, like most manufacturers, he had to rent the facility for a whole week, and destroy 11 x £1500 prototypes in 11 x £1,000 tests: and the Swedes only had 2 x ‘twelve year old’ dummies, so had to rent 2 more in when he came…. Multimac was fully approved at the end of 2008, after 13 years and £750,000, and launched into a world with an economic crisis. No British bank believed there was a market for it [despite 100,000 British families having a third child every year…] and so Multimac has largely self-funded, and now has sales throughout most of the world, to the whole social spectrum, and in cars from 20 year old hatchbacks to Bentleys and Porsches. Having grown up in the Multimac, 2 of Maclivers daughters now work for the company and it continues to grow and succeed despite such a long and hard time getting it to market.